Home » H.A. Kidd knitting supplies » Oh, Major, how shall I describe thee? This week at KNITmuch, we’re playing – yes, I said playing – with Major, a bulky, 100% acrylic yarn. Five of Major’s 35 colorways. From top to bottom, Crimson, Stonewall, Firecracker, Verdant and Honeydew. Major is a “poofy,” softly spun yarn that’s twisted (plied) in a marled fashion. As I dissected it, I discovered more and more ways to describe it! Major has a whopping 35 colorways, all with some type of variegation. Some are monochromatic (various shades of the same hue like Crimson in the photo above), some contain neutrals, like Stonewall (in the photo above) and Graphite, and others are bold combinations of bright, brilliant, and unrelated colors. I chose 5 colors to review this week: Honeydew, Crimson, Firecracker, Verdant, and Stonewall. Today, I’ll explain some of the color descriptors. 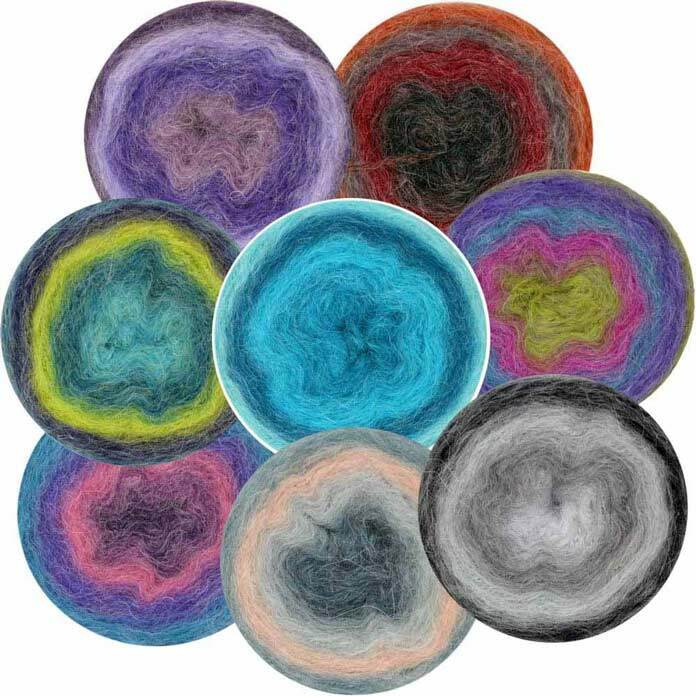 There are several ways to describe yarns that have multiple colors in them. Major employs 2 of them. A variegated yarn is one that changes from one color to another every few inches to every few feet, perhaps even every few yards. The colors will, ultimately, repeat along the strand of yarn. Sometimes they’re dyed to make a repeat that mirrors itself. An example of a repeating variegated colorway is gray, cream, beige, pink, and then repeat. A mirrored example of the same colorway would be gray, cream, beige, pink, beige, cream, then repeat from the beginning. and so on. A variegated colorway can have the colors repeat, as in the example on the left, or they can be “mirrored,” as in the example on the right. 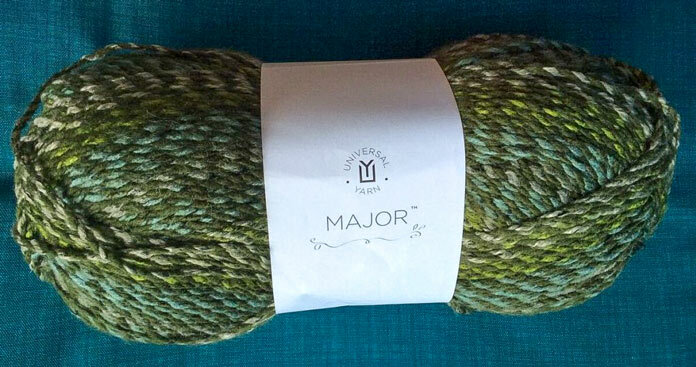 When we look at the skein of Major, we see the different colored sections on the outside. Even the Crimson colorway has different shades of red. This tells us that Major is a variegated yarn. Different shades, and hues of redshift through this skein of Major. But wait – there’s more! 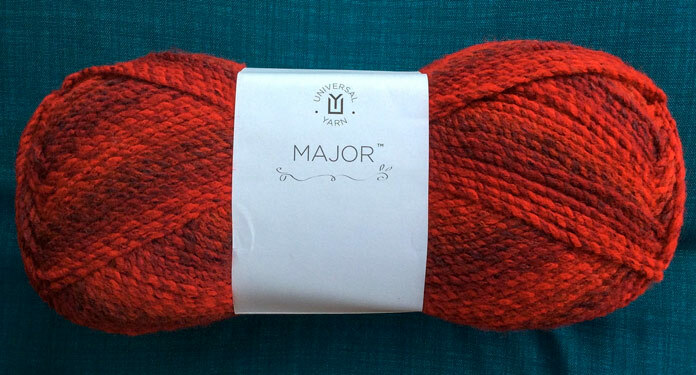 Major is also a marled yarn. A marled yarn is made of two or more plies of yarn with each ply a different color. When I think of a marled yarn, I go straight to the work socks my Dad wore when I was young. If work socks don’t ring a bell with you, think of a sock monkey – they were originally made from the same type of work socks. Marled yarn gets its name from when the plies are twisted. Each ply is a different color, and, as they twist, they become “marled” together, creating peek-a-boo shots of color in the finished yarn. High contrast between the two plies throughout this skein of the Verdant colorway, offers an excellent example of a marled yarn. Marled yarn can be made with one ply of one color and two or more plies of a second color. Depending on how this is done, different effects can be achieved. The color can be strengthened by using two plies of it and one of a neutral, or it can be diluted by making the multiple plies something like grey or black, that will “bring down” the strongly colored strand. A marled yarn can also be variegated or gradient, depending on how each ply was spun. 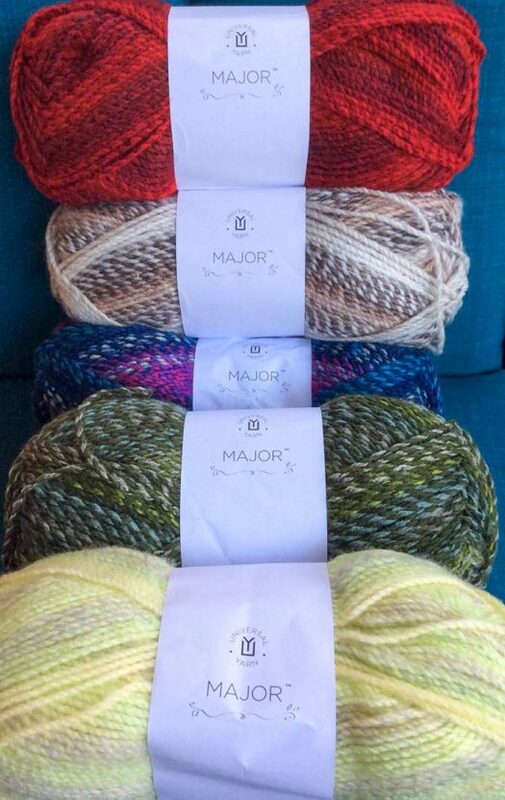 When we look at our skeins of Major, we can see that in addition to twisting around each other, the colors also change, making Major a variegated, marled yarn. The third color descriptor for a yarn – which doesn’t apply to Major – is gradient. A gradient yarn starts with one color at the beginning of a skein, and it ends with a completely different color. The color changes in between can be monochromatic (all in the same color family like the center ball in the photo below) or they may be dramatic, changing from one bold color to another. These 8 ‘cakes’ are a graduated yarn called Revolutions. A graduated yarn changes from one color to another across the entire length of the strand, unlike variegated yarn, that has repeats of colors. Our skein of Major in this stunning ruby red has dark flecks of fiber in each of the strands. It’s easy to see how the yarn in the skein shows shifts from ruby red to deep ruby to almost a burgundy and that different shades of red twist around each other. This skein of Crimson appears to have black flecks in it. When I separated a strand of the yarn to better illustrate that each ply is a different color, I made a rather startling discovery: Major is a core-spun, variegated, marled yarn! That’s where the black flecks come from! What’s a core-spun yarn? A core spun yarn usually is made from a strand or two of strongly spun fibers around which a softer, loftier fiber preparation is spun. In the case of our red skein of Major, the core is two strands of highly twisted black ‘threads’ around which the different colors of red fibers are spun. These black strands peek through the softly spun red fibers and add another dimension to the yarn. Left to right, I’ve wound a full strand of Major, then I’ve wound a length of each of the two plies to show the different shades of red, and then a wrap showing the pair of black core strands.